Do you have an adapted car? When people ask how I drive, I simply ask them how an individual would generally drive an automatic car. They point out that they would use their right foot for the brake and accelerator. They then normally look at me and realise that I am just able to use my left leg for everything that they would use their right leg for. 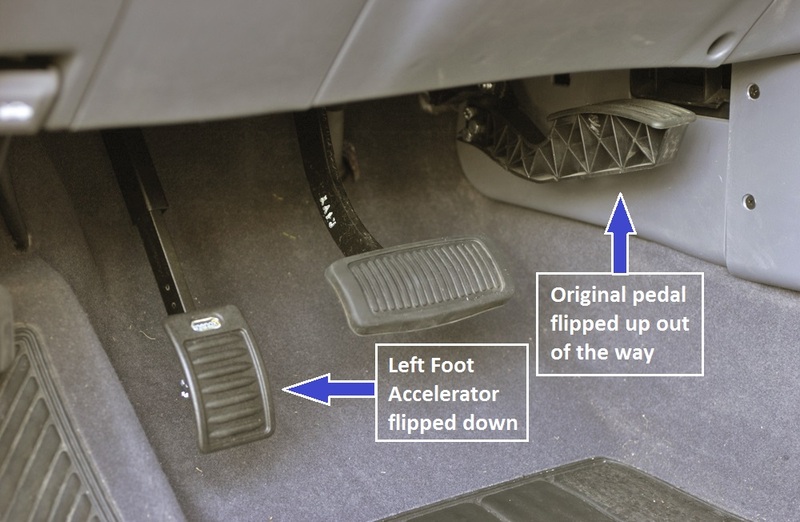 I actually have an adapted car in terms of a left leg accelerator. The pedal, which is normally on the right hand side, is swapped to the left side so that it is nearest to where I would generally place my foot. At the same time, the original right-sided accelerator is lifted out of the way, which can be flipped down to be used in the standard way. How do you drive with one foot? It might surprise you however I am more than happy to drive a manual either with or without a prosthetic. Having said that, for safety and comfort, I drive an automatic. Using just one foot for a manual is pretty difficult. I would have to turn my foot sideways in order to apply the brake and clutch at the same time while getting the biting point before jumping over to the accelerator. It’s certainly extremely tiring and difficult and I wouldn’t recommend it to anyone. Hand controls - This simply puts the work that the feet would normally do in the hands of…your hands. Generally there will be an extra lever next to your steering wheel which allows you to pull towards you for acceleration while pushing away for the brake. Some hand controls also come with an additional switch to allow you to use the indicators. Trigger accelerator - Similar to the above however you pull and push with your finger to accelerate instead of your hand, with the hand controls. Over/under ring accelerator - This is placed in front (over ring) or underneath (under ring) the steering wheel and is pulled towards the steering wheel to accelerate. Ghost ring accelerator - This is placed behind the steering wheel and the speed is controlled by turning the wheel with the fingers. Pedal modifications can also be made so that your limbs, or stumps are able to reach the pedals. Easy release handbrake - an extra attachment to help in applying the handbrake. Steering balls - a ball placed on the steering wheel to assist in steering the wheel. Remote control devices - electronic devices often positioned on the steering wheel, which allow for multiple controls to be used with one hand (indicators, lights, wipers etc). If you’re worried about driving post-amputation, try and go with a friend to help ease you into it. Take a look at the Motability website, which shows a lot of the adaptations that are available (https://www.motability.co.uk/cars-scooters-and-powerchairs/adaptations-overview/). Motability also have sessions where you are able to try out the modifications before applying them to your car. As always, check with the DVLA to ensure that you are okay to drive beforehand and always tell your insurance company of any modifications that you have made.